The ASEAN Foundation and SAP concluded the ASEAN Data Science Explorers (DSE) National Finals at the Makati campus of the Mapua University. University students from all over the Philippines, who took part in the competition, were awarded the top three awards for their insights and innovative ideas addressing social and economic issues in the ASEAN region. This is the second consecutive year that ASEAN DSE was organized across all 10 ASEAN member states as part of the strategic partnership between the ASEAN Foundation and SAP. First introduced in 2017, the ASEAN Data Science Explorers (ADSE) is a data analytics competition that aims to enhance awareness and appreciation of the ASEAN community amongst young people through digital literacy intervention. By using the SAP Analytics Cloud, participants are encouraged to deliver data-driven insights which highlight issues in ASEAN across six United Nation Sustainable Development Goals, namely (1) good health and well-being, (2) quality education, (3) gender equality, (4) decent work and economic growth, (5) industry, innovation & infrastructure and (6) sustainable cities and communities. Titled “Today’s Youth for Tomorrow’s World”, this competition allowed youths from ASEAN member countries to play a key role in tackling today’s social issues in the region and help create positive change for a better future. In the photo: Vivien Reyes, senior director and chief information officer, Ayala Foundation, Christian Louie A. Belleza, ASEAN, Philippines National Secretariat Department of Foreign Affairs, Philippines, John Rusty Perena and Jade Hizon of team Dimicrocambio of Nueva Ecija University Science and Technology, Edler Panlilio, managing director of SAP Philippines and Christine Joy R. Bautista, Lead Educational Advancement and Development School Corp. Team Dimicrocambio from Nueva Ecija University of Science and Technology emerged as the champion at the National Finals. Meanwhile, the first runner-up position was awarded to Team Bazinga from Mapua University, and the second runner-up was given to Team Tony from De La Salle University. “Together with the ASEAN Foundation, we are encouraging youths to be creative and develop innovations to address the social and economic issues that our country and others in the region face, especially as a key member of the ASEAN. We have witnessed great and inspiring ideas presented by all contestants that could be the important key an improved ASEAN society,” said Edler Panlilio, Managing Director of SAP Philippines, who acted as one of the judges in ADSE Philippines National Finals 2018. 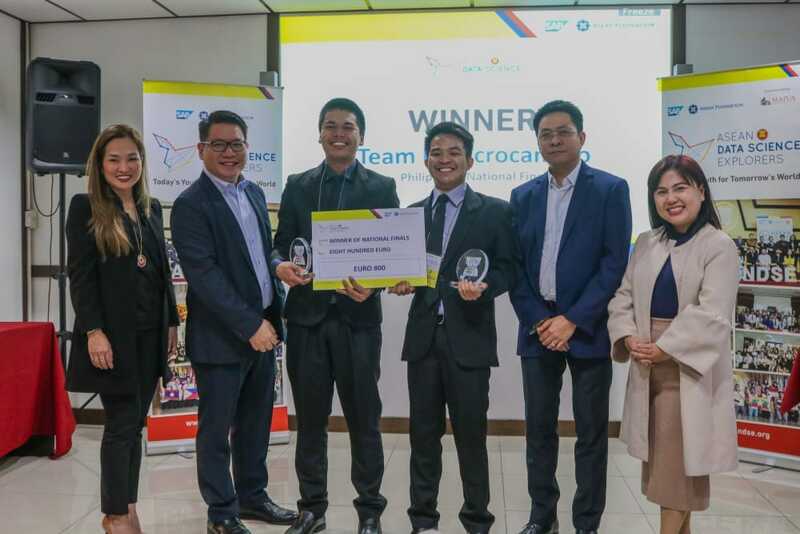 “We at SAP operate on the mission to help the world run better and improve people’s lives and wish to involve the youth in the same mission and use technology to contribute to the Philippines and to the ASEAN region. Leveraging the first-class insights provided by SAP Analytics Cloud, SAP enabled the students to access and analyze real-time data of the current social and economic crises in ASEAN member nations,” explained Panlilio. SAP has operated in ASEAN for over 29 years, engaging over 18,000 youths in 100 institutes of higher learning annually with SAP’s curriculum. Through their partnership with the ASEAN Foundation, SAP has a goal to help prepare more young people for the digital economy and support ASEAN drive sustainable socio-economic growth in the Fourth Industrial Revolution. “In our first year, we impacted 800 students. In 2018, to date, we have trained more than 2,000 students across Southeast Asia on SAP Analytics Cloud and tripled our number of submissions,” added Panlilio. Students who registered for the program earlier in the year gained access to ASEAN datasets as well as the SAP Analytics Cloud platform, which allowed them to analyze the data and derive insights. The SAP Analytics Cloud is new generation software as a service (SaaS) that redefines analytics in the cloud by providing business intelligence (BI), predictive, and planning capabilities all within one tool. Using this cloud platform, the participants could analyze and visualize data to come up with their innovative recommendations. The assessment was based on three criteria: the relevance and credibility of data, the quality of analytical insights, and the feasibility of recommended solutions to the problems addressed by each project. Out of 11 finalists, the first place winner will proceed to the Regional Finals happening on 25 October 2018 in Singapore, where they will face the top winners from other National Finals rounds. I love how us millennials have been doing some effort in order to make a better world. I hope that will all of this works, we as a whole, can become a country with camaraderie. Not just hospitable but have the heart to help others. Let's hope for the best, win or not, we all are winners in the heart of the people. Welcome! 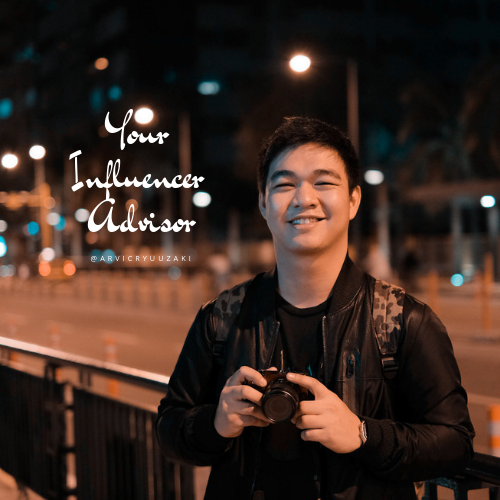 I’m Arvic Inosa, based in Metro Manila. Loves food, technology, hauls, korean culture and different styles. Copyright 2018, ARVIC RYUUZAKI. All rights Reserved. Template by Colorlib.